How do I Register and create accounts? 3. Complete the form with your information. • Type your email address, first name, and last name. It is important that your email address is correct. If you forget your password, the LMS will send an email to this address to enable you to log in and reset your password. • Choose your username and a password for your account. • In order to improve the security of the LMS, we use a slider mechanism during the registration process. Use your cursor to slide the blue box from left to right. 4. Click Register. You’ll then be signed in to the LMS where you can activate a product or join a class or school. 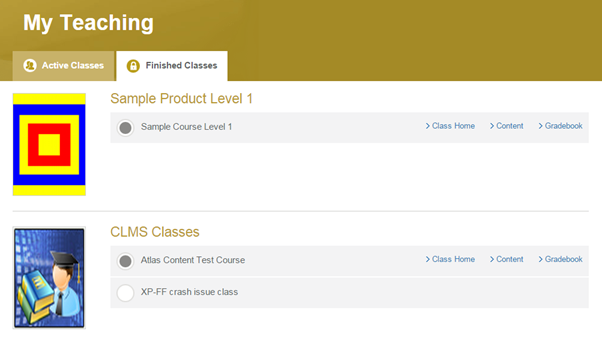 How do I use the class tools in the LMS? There are a number of tools in the LMS for teachers and students to use to work together online. Click the link below and watch the videos to learn how to find and use the tools. What are the terms used in the FAQ? User: A user is a person that has an account in the LMS. Users can log onto the system. Users are given access to classes as teachers or students. It is possible for the same user to be a teacher in one class and a student in another. Student: This is a user that has been given student permissions in a class. Student permissions allow the user to view content, access the tools, and view their own scores and grades. Teacher: This is a user that has been given instructor permissions in a class. 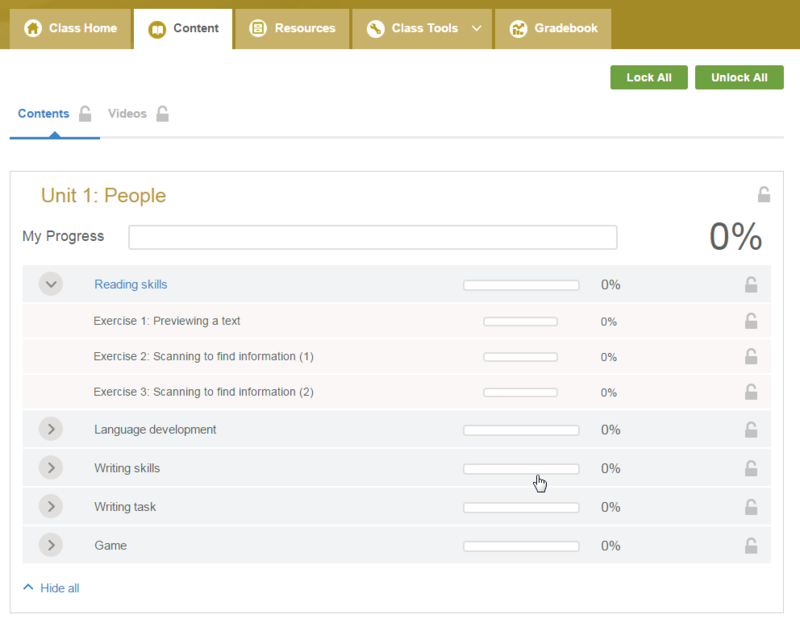 Teacher permissions allow the user to view the scores and content generated by all the students in the class.Teachers who are affiliated to a school account are not able create classes, unless they have been granted class creation privileges by a Client Administrator from that school. Client Administrator: This is a user that has been given Client Administrator permissions on a School Account within the LMS. The Client Administrator can create and manage classes, enroll teachers and students into classes, and more. Class: In the Cambridge LMS a class holds learning content and tools such as blogs and forums. Adding a student to a class allows a teacher to see the student's progress through the course materials. Adding a teacher to a class gives them access to the content and access to the grades of the students in that class. Group: A group is a way for a Client Administrator to organize classes so that the classes can be found easily. We recommend that classes are organized in semesters or terms. School Account: School Accounts are useful for institutions with a large number of teachers. A user associated with a School Account can be given Client Administrator permissions and is then able to manage multiple classes and teachers within that School. What are the technical and system requirements needed for the LMS? Requirements listed below represent what the LMS can support. Requirements for individual products may differ; please also refer to the product’s documentation for product- specific technical and system requirements. Where can I find the activation codes? Activation codes are either on a card attached to the Student's Book or printed on the inside front cover of the Student's Book. How do I change times to a preferred time zone? 1. Click on the gear icon next to your name in the upper right corner of your screen. 2. Click My Account . 3. Click the Edit tab. 4. Scroll to the bottom of the page, and select your correct time zone from the drop down menu. Reports will then display correct times accordingly, but tasks in the CLMS are carried out based on server time and this cannot be changed as this applies to all users. What is a School account and why might I need one? School accounts are a convenient way of organising classes for users at schools with a large number of students and teachers. Their main advantage is that they can have users with Client Administrator access added to them who can then create multiple classes at a time and can manage all of the teachers and classes who are connected to that School account. Client Administrators can also add multiple teachers to the same class. To set up a school account please contact your local Cambridge University Press sales representative. If you plan to manage your classes yourself or if your school does not have a teacher who wants to take on the Client Administrator role then you can continue to use the LMS as an individual teacher. What’s new in the latest version of the LMS? More detailed downloadable school reports - We’ve significantly increased the amount of detail included the downloadable school reports. This will now allow Client Administrators to view all of their student’s scores at a glance in a downloadable spreadsheet. Portuguese now available from the language selection - In addition to English, Russian, Spanish and Turkish you can now choose Portuguese from the language selection tool. New landing page for the LMS - There are currently three versions of the LMS which operate in the same way but have different selections of products on. You can navigate to these using the URL’s www.cambridgelms.org/touchstone (For the 1st editions of Touchstone and Viewpoint) www.cambridgelms.org/primary (For all our products aimed at young learners) and www.cambridgelms/org/main (for all of our other products). What’s new is that if you head to www.cambridgelms.org you’ll now reach our new landing page. This is designed to help you find which version of the LMS you need to access. Just enter the name of your course here and you’ll be taken to the correct page. System status page - We’ve added a link to our new System Status page. You can find this on the navigation bar at the bottom of the page. Clicking this link will take you to a page containing details of any current technical issues affecting the LMS. What is e-commerce within CLMS for? CLMS e-commerce delivers an online method for you to pay for selected products. What products can I make purchases for using e-commerce? At the moment we have limited e-commerce purchases to the following products. The initial pool of Countries included for e-commerce are; Spain, France, United Kingdom, Italy, United States, Netherlands, Germany, Greece, Portugal, Canada, Belgium, Austria, Ireland, Andorra, Slovakia, Luxembourg, Malta, Monaco, Gibraltar and British Virgin Islands. You need to be a registered user on the CLMS to allow for a product purchase to be made using e-commerce. The following link contains guidance on how to register. How can I access e-commerce? E-commerce can be accessed by selecting the ‘Buy Materials’ tab from the home page or within the top banner once logged in. You will be prompted to register to enable you to complete a purchase. How do I find the product that I would like to purchase? You will be presented with a store that lists the products with the ability to search. Searching can be completed via product name, ISBN and author and also using a partial product name data search wildcard "partial data input". If you are a student belonging to a class there is an option to enter your class code and the required product will automatically be selected. Once the order is placed you will be able to access this via your ‘My Orders’ tab from the top banner.You will also receive an email confirming your purchase. Can I purchase a product on behalf of someone else i.e. student/child? Yes, the product will be defaulted for use by the purchase however from ‘My Orders’ you will have the opportunity to allocate the product/s to another user if it has not been purchased for your own use. Upon allocating there is the ability to register a new user to the system. Once the product has been allocated to another user this can be access via the Allocated tab within their ’My Learning page’. Cambridge University Press can currently only accept Visa, MasterCard and American Express as payment methods. There are no current plans to extend this. How do I know if payment has been successful? If there are any issues upon processing the payment you will be informed with an error message detailing the problem along with confirmation that payment has not been taken. How do I know if I have activated the product? How do I access a class I have joined? 2. Select Class Home next to the name of the class you want to access. My Account allows you to view and edit your personal profile (including email address and password). 1. Click the in the top right corner of your screen. 2. Select My Account . Email address you used to register on the Cambridge LMS . Password you use to access the Cambridge LMS . Profile Photo displays in the user directory (max dimensions = 80x80 px, max size = 50 KB). Default Time Zone where you currently live and work in. 2. Select Save to complete your account changes. 4. Select Save to save changes to your personal information. What is Content? How is it used? Content is where you find your online interactive lessons, readers, assessment and other content. Your progress will be recorded as you work through the content and your performance will be recorded. You can access the class content in several different ways. 1. On your Home page, select Content next to your class name. 2. From your Class Home page, select My Activities . 3. 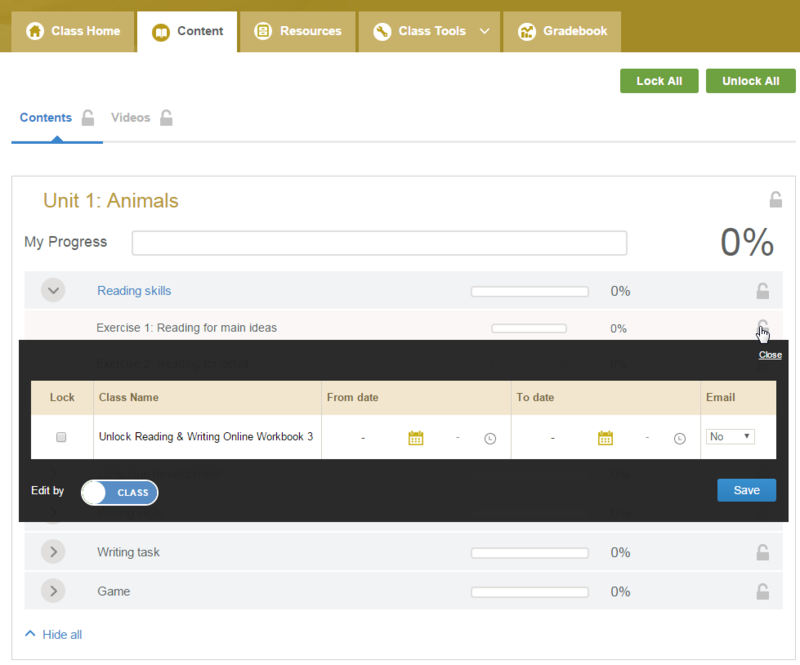 From anywhere within your class, select the Content tab at the top of the page. 4. On the Content page, select the activity you want to work on. What are the tools listed in my class? In your class, your teacher may decide to use any of the teaching and learning tools below. Note: Each course is different. Therefore, the class you are taking may use some, all, or none of the tools above. The Forum is a place where teachers and students can ask questions in discussion threads and reply to questions in other threads. Everyone in the class can read and reply to any thread. 1. Go to your class. 2. Select Forum in the Class Tools drop-down menu. 3. Select in the Forum you want to post a message in. This will display all of the topics in that particular Forum. 4. Select next to the topic you want to read. This will display all of the threads in that topic. 5. Select the discussion thread you want to read. The thread will open in a new page. 6. Select Reply to respond to the question asked in the thread or select Comment to respond to other student’s post. 8. You can record your voice and include the recording in your post (voice recording is not currently possible on iPads). 9. Select Add. To cancel your post without saving it, select Cancel . 10. You can delete your post after you have added it. To do this, select Delete next to that post. Students can create discussion threads in existing forums and topics only. 3. Select in the Forum you want to create a new discussion thread in. This will display all of the topics in that particular Forum. 4. Select Add thread in the topic you want to add a new discussion thread in. A new page will open in which you can post your question to start a discussion. 5. Give your thread a title and write your question in the Message field. 7. You can record your voice and include the recording in your post (voice recording is not possible on iPads). 8. Select Add & exit . To cancel your post without saving it, select Cancel. 9. You can edit or delete your thread after you have added it. To do this, find your thread in All Forums page and select Edit or Delete next to it. The message board tool can be used for real-time, conversations between teachers and students in a class who are signed in to the class at the same time. Instructors can create an "Online Office Hours" message board for student questions and answers. Collaboration groups in different locations can use the message board as a space to have conversations across distances or to catch up with conversations that they may have missed. Posting in the message board. 2. Select Message board in the Class Tools drop-down menu or the class Dashboard. 3. Type a message in the field provided. A blog is an online journal in which individuals can write entries, ordered by date, which they can share with others. Members of the class can comment on each other's entries. The blog tool allows you to create a learning diary that can be shared with your classmates or just your instructor. It also gives you a chance to think about your own learning and to share your experiences. 2. Select Blog in the Class Tools drop-down menu or the class Dashboard. 3. Select the title of the blog you want to read. Blog entries are displayed with the most recent post listed first (at the top of the page). 4. If there are any comments on an entry, they are displayed below the entry. 2. Next to Title , type the subject (i.e. title) of your message. 3. Next to Comment , type your message in the text box. You can use the icons at the top of the box to format your entry. 1. Select New post in the actions bar. 3. Next to Description, type your entry in the text box. You can use the icons at the top of the box to format your entry. 4. Select Add or Save Draft. If you choose to save a draft, your blog entry will not be visible to other members in your class. You can come back at a later time to edit and publish your blog. 1. Select My posts in the actions bar. 2. Select Actions next to the blog post you want to edit. 4. Edit your Title and/or Description. How do I use the calendars? There are two types of calendar tools in the Cambridge LMS. My Calendar shows all the calendar events for all of the classes you are taking. Each class you are in also has an individual Class Calendar, which contains only the items for that class. 1. Log into the Cambridge LMS. 2. Access the class in which you want to view the calendar. 3. 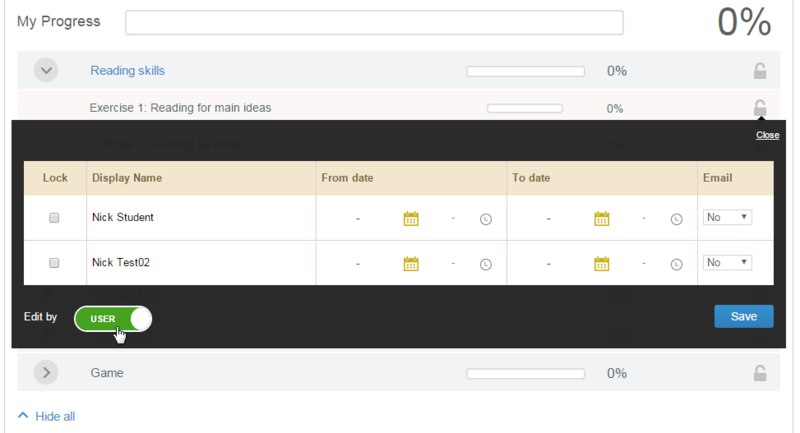 Select Calendar in the Class Tools drop-down menu or the class Dashboard. 2. From any page, select Calendar in the black bar at the top of the page. You will see a monthly calendar view by default. You can change your calendar view to be by the day, the week, or the month. Select Month, Week, or Day at the top left of your calendar. If your calendar has a lot of events in it, you can look at a custom list of events. 1. Select Event list on the top right of your calendar. 2. Choose the format in which you want to view your events (a list, a daily calendar, a weekly calendar, or a monthly calendar). 3. Choose the date range you want to look at (events for today, this week, this month, or this year). Your instructor may use the announcements tool to post class updates and reminders or to share additional extra materials. You should check Announcements every day to make sure you do not miss important new messages or information. 2. Go to your class. 3. Select Announcements in either the Class Tools drop-down menu or the class Dashboard. Who do I contact if I am having problems with my course or access to it? In the first instance you should contact your Teacher. If they are not available you should contact the School, College, or University you registered with, and discuss the problem with a Course Administrator. What is Self-Study mode? Why has my Self-Study class disappeared on joining a teacher-led class? Many of our courses are available to be used both within a classroom environment with a Teacher’s guidance or as a self-study course that you can use without needing a Teacher’s input. If your course comes with a self-study version you will automatically be enrolled in a self-study class when you first activate your code. You can then access this from the Self-Study tab on your My Learning page. If you want to join a class which a teacher has set up for you, you can either enter the class code or ask the teacher to enroll you in the class manually. It’s worth noting that any progress you’ve made in Self-Study mode will not be visible to your Teacher when you join their class. Your teacher can also choose to disable your self-study class once when you join the teacher-led class. How do I use the Cambridge LMS? Take notes as you watch the videos. If you have any questions when you're finished, please contact your local Cambridge University Press Representative. My Profile allows you to view and edit your personal profile (including email address and password). 1. Click the in the upper right corner of your screen. • Email address you used to register on the Cambridge LMS. • Password you use to access the Cambridge LMS. • Profile Photo displays in the user directory (max dimensions = 100x100 px, max size = 50 KB). • Default Time Zone where you currently live and work in. How do I access classes I teach? 2. Click on the My Teaching tab. 3. Select the title of the class you want. Discussion threads are added to topics in forums. Teachers can either create new forum and new topic or add a discussion thread to the existing one. 3. To create a new forum, select New forum . Add a title for the forum. 4. To create a new topic in a forum, select New topic next to that forum. Add a title for the topic. 7. You can record your voice and include the recording in your post ((voice recording is not currently possible on iPads). 8. Select Add & exit . To cancel your post without saving it, select Cancel . 6. Select Reply to respond to the question asked in the thread or Comment to respond to another student’s post. 9. Select Add . To cancel your post without saving it, select Cancel . Teachers can delete any forum, topic and thread. Note that if there are responses in a thread, all responses have to be deleted first before the thread can be deleted. Similarly, to delete a topic, all threads in the topic have to be deleted first. And to delete a forum, all topics in that forum have to be deleted first. Students can be asked to blog regularly and to read their classmates' blogs. Readers can comment on blog entries. Instructors and students have the ability to create and post to their personal course blogs. 1. Access the blog tool from the Class Tools menu. 3. Type in the title and the text of your blog entry. Choose who can view the blog entry. Blog entries do not have to be available to every member of a class. They can be private or only viewable by instructors. 4. Select Add . To save the blog entry as a draft to be published at a later date, select Save draft. Blog authors can edit draft entries or posts that have already been created (if permissions allow). Instructors and administrators can edit all blog entries. 4. Select Add to save the changes, or select Save draft to turn the published entry into a draft that can be published later. The blog tool creates a list of all the blogs in a class. Administrators, instructors, and students enrolled in a class can view a list of all blogs and link to the ones they want to read. Entries that the student makes private are not visible. Entries that are made available only to the instructor are not shown when students browse a blog. Access the blog tool in the Class Tools menu. 2. Select the link to a user's blog to view the post in full. In some cases, an instructor or administrator might want to remove or hide a blog entry. Removing an entry is permanent and cannot be undone. Hiding an entry prevents students from being able to view it, but it does not delete it. 1. Access the blog containing the entry to be hidden or removed. 2. Select Remove to remove the entry or select Hide to hide the entry. 4. Select Save Draft . The message board tool can be used for real-time, unstructured conversations among class members who are signed in to the class at the same time (i.e. is a Chat tool). Instructors can easily create an "Online Office Hours" chat room for student questions and answers. Collaboration groups in different locations can use Message Board as a space to have conversations across distances or to catch up with conversations that they may have missed. 1. Access the Message Board from the Class Tools drop-down menu. 2. Type a message in the field provided. Administrators and Instructors can facilitate multiple discussions by adding additional message boards to a class. 2. Select Private message board . 3. Select Create message board . 4. Type a title and description for the room. If desired, add taboo words. These will be shown as asterisks (****) if sent in a message. 5. Select Save & Exit. How do I use the Announcements? The announcements tool is used to give students up-to-date information. Announcements can have multiple attachments, such as documents or URLs. You can sort announcements by subject, sender, access or date. Announcements are a useful way to post a notice about an important change in deadlines, meeting times or meeting locations. Administrators and instructors can post announcements in a class. These announcements appear in the class announcements area. 1. Go to the class. 2. Select Announcements in the Class Tools drop-down menu. 3. Select New announcement . 4. Next to Title , type the subject (i.e., title) of your message. 5. Next to Comment , type your message in the text box. You can use the icons at the top of the box to format your entry. 6. Type the announcement message in the text editor. Use the formatting options in the text editor (i.e., font size, color, add images) to format the announcement. 7. Select the announcement visibility ( Show , Hide , or Specify dates ). You can specify announcement beginning and end dates to make announcements appear and disappear automatically. This feature allows instructors to preload their course with announcements (e.g., due date reminders) and have them appear at pre-determined times with no extra work. The default announcement option ( Show ) makes announcements available for the duration of the class. 8. If desired, select the announcement deadline. Announcements with deadlines will display the number of day(s) left next to the title. 10. Select whether to send an e-mail notification to course participants. The default is set to No . This means that students will have to log in to the Cambridge LMS to view the announcement. If Yes is chosen, the announcement is sent to course participants via external e-mail. 1. Log in-to the Cambridge LMS. 3. Select Calendar in the Class Tools drop-down menu. 2. Choose the format you want (a list, a daily calendar, a weekly calendar, or a monthly calendar). When uploading files to the Calendar or Announcements sections in the Cambridge LMS, please note the file size limit of 5Mb. 2. Select Calendar in the Class Tools drop-down menu or the class Dashboard. 4. Next to Title, type the subject (i.e., title) of your message. 5. Choose whether the event is for all students in the class, or specific students. 6. Specify the event dates. 7. Next to Description, type a description of the event in the text box. Use the formatting options in the text editor (i.e., font size, color, add images) To change the appearance of the announcement. 8. Set the priority (High, Medium, Low) of the event. 9. Choose the event type. 11. Select whether to send an e-mail notification. The default is set to No . This means that students will have to log in to the Cambridge LMS to view the event. 12. Select Save & exit . How do I access finished classes? Select the Finished Classes tab. Here you can view your finished classes and access the class tools and content in the same way that you access active classes. 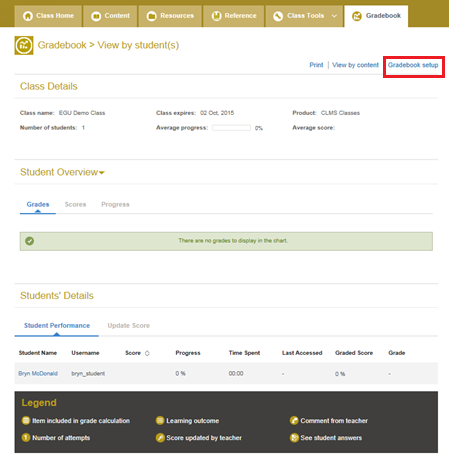 The Gradebook is a tool for teachers and students to view such data about students' interaction with course items as: scores they have achieved; how many activities they have completed (progress); and time they have spent on each activity. Each screen in the Gradebook is printable. • scores for all course items including at attempt level for activities. • course grades if enabled in a course. • teacher's comments on their scores for each activity individually. • access a summary view called View by Students listing all students in the class and their overall course score and grade. • access a view called View by Content listing all gradebook items, average score and progress achieved by all students in the class. • access each student's gradebook. • access a detailed view of each gradebook item listing scores for all students in the class. • sort data to display scores in the selected order. • access charts showing distribution of scores and progress in the class. • comment on each student's scores individually. • add their own gradebook items to track scores for offline activities. • override any score in the gradebook. o define course grade format based on a 100% scale. o choose when to distribute course grades to students. How can I customise the Gradebook? 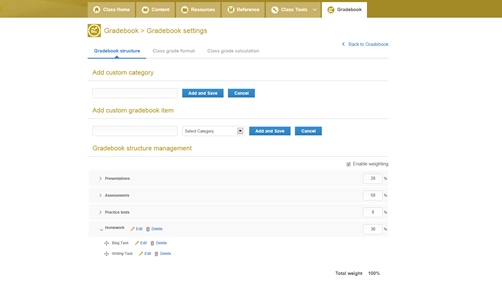 • add custom categories to the Gradebook. These can be used for example to track activities that take place offline such as homework, attendance, or essays. • enable weighting for categories (only available if "Enable grades for this course" has been selected on "Course grade format" tab). This can be used if you would like to change the relative weighting of individual categories, e.g. give the Tests higher weighting than the Games category. Note that weighting values are taken into account when calculating course grades only. • Choose format of grades and threshold values. Changing of grade names, colours (used in grade pie chart) and threshold values is possible. • "Release course grades to students". Until this is selected, students have no information about their grade. They only see the statement that their course grade is not released to them yet. This tab is only available if "Enable grades for this course" has been selected on "Course grade format" tab. On this tab a Teacher or Client Administrator can select which course items are taken into account when calculating course grade. 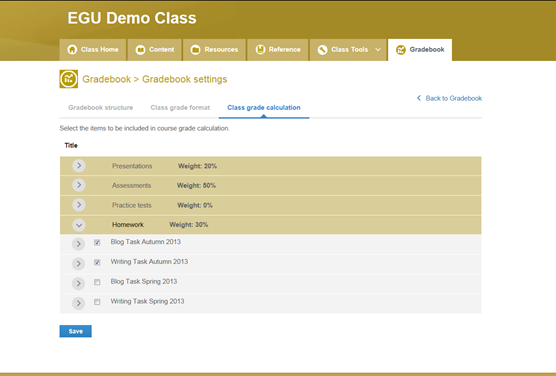 On the screenshot below a sample setting is shown in which Spring term Homework tasks do not contribute to the course grade. How are Student Progress scores calculated? • Graded Score: This is the total percentage of questions the student has answered correctly out of all of the content selected as part of the student’s grade. • Course score and course progress - are calculated for the course as an average of all items in the gradebook which have scores and progress data. • Course Time spent - is a total of all time spent values for all items in gradebook. • Course Last accessed - is the time of most recent access to a course item. By default, these are only calculated for students who attempt and record a score. They do not take into account any student who has not attempted and recorded a score. However, teachers have the option to edit the Course Grade settings to take into account students without scores. This gives those students a 0% score which is then factored into the average course grade. Students can still go back into a finished lesson and work on activities. Who do I contact if one of my students is having problems with my class or access to it? In the first instance, you should try to assist the student with their problem, use the call logging template and Frequently Asked Questions to assist you. Next you should contact the Administrator in your School, College, or University and again use the call logging template to provide as much information as possible to assist them. Finally, if they are not available or you do not have an Administrator in your School, College, or University, please email: [email protected] and once again, use the call logging template to provide as much information as possible. Where do I find the call logging template? A copy of the latest template can be found here: "Call Logging Template" . You can choose which content your students have access to and set times for new content to become available by using the lock controls on the content tab. To do this, navigate to your class and then click content. You can lock a unit or exercise by clicking the padlock symbol. This will stop students in this class from being able to open this content. You can also choose to make the content lock or unlock on certain dates. To do this, click the padlock symbol by the side of the exercise you want to control and then enter the dates when you would like the content to be available. You can also choose whether to make content available to an entire class or specific students using the “Edit by”switch. One of my students is reporting their score/progress is not updating. What can I do? 3.The student is closing the content correctly. Student answers will not be recorded unless the student progresses to another exercise or closes the content using the X button. How can I create classes with a Teacher account? If you have a Teacher account and have been granted class management permission you can create your own classes from the “Create a class” button at the top of your My Teaching page. The class will be created once you’ve entered a class name and chosen a course. If you don’t see the “Create a class” button on your My Teaching page this may mean you don’t have class management permissions. If you’re an Independent Teacher you should have this by default however if you are a member of an institution with a School Account and Client Administrator you may need to ask your Client Administrator to grant you class management access. How can I get class management permission? Please contact your institution’s Client Administrator. They will be able to grant you permission for this role. If your institution does not have a Client Administrator, please send a request to [email protected] making sure to include your username and the name of your institution. What is the difference between Progress, Score and Graded Score? The Progress is how much of all the materials in the course the student has clicked through. This just means that they have accessed the pages/screens; it doesn't necessarily mean that they have done the activities on the pages. So for example if the course contains 12 Units and they have clicked through two of the units, their Progress would be 17%. Progress does not indicate how well the students have done, only how much they have accessed. The Score is how well they have done the activities that they have attempted. This takes into account any of the materials they have tried, whether those activities are part of the Graded Score or not. So in this example, if they clicked through 2 of the 12 units without attempting any of the activities, their score will be 0%. If however they got everything correct in those two units their score will be 100%. The Graded Score is how well the students have performed on those materials that the teacher or the Client Administrator has included in the grade calculations. In the above example, if the teacher has included all 12 units in the Graded Score, the student has done the first two units and got everything correct in those two units, their Graded Score would be 17%. If they completed six units and got everything correct, their Graded Score would be 50%. Careful: if a student completes activities that are NOT included in the Graded Score they won't count. So if the teacher includes units 1 - 6 in the Graded Score and a student does units 7 and 8, their Graded Score will remain 0% until they complete some activities in units 1 - 6 successfully. Why can’t I see all of my classes on the My Teaching tab? If you’re a member of multiple schools or campuses you may not see all of your classes on your My Teaching page. This is because the My Teaching page only shows the classes on one of your campuses at a time. If you’re not able to see some of your classes the first thing you should try is checking that it’s not on a different campus. To change the campus you’re viewing just click the arrow by the name of your current campus at the top of the page. You’ll then get the option to choose from all of your campuses in the drop-down menu. What training or expertise does the Client Administrator need? As Client Administrator, you will need to carry out various functions on the LMS. Click the link below and watch the videos to find out how to do the tasks. Take notes as you watch the videos. When you are finished if you have any questions, please contact your local Cambridge University Press representative. What does the role of Client Administrator involve and how many hours a week are needed? Client Administrators can create and manage classes and users in their institution and/or campus. They can also use reporting tools to see student progress, export that data to a CSV file, and view LMS access statistics. If you enroll students manually, it takes about 35 hours to enroll 5,000 students. Client Administrators are also the first line of support for all other users in their institution. A full job description and person specification is available. What happens if there's a technical problem or question the Client Administrator cannot answer? Who can help? All problems arising that the Client Administrator is not able to deal with, should be emailed to: [email protected] . Include information as per the "Call Logging Template" to assist with any investigations. What is a School Code and how do I use it? School Codes allow new teachers to join your School during the registration process. You will receive a notification confirming your School Code by email and an Announcement when logged in. 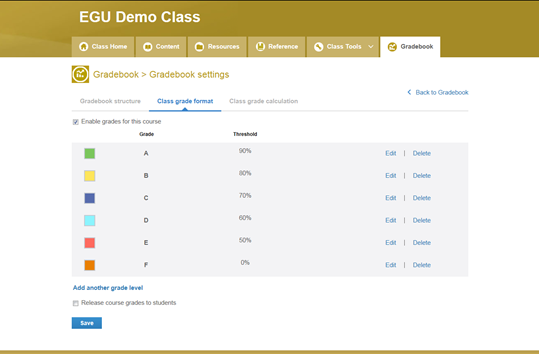 Once authorised at the required Campus, via the Teacher Permissions page, the users will be able to create and manage their own classes. We recommend that the School Code is changed when a teacher leaves the School. Each time you change this make sure to inform other affected Client Administrators and Teachers. I have multiple Campus sites and want to manage them individually. How do I request this? You can easily manage your multiple campuses by clicking the arrow beside the your school name on the My Admin or My Teaching pages and choosing from the drop down menu.You can also select which school opens by default when you log in to the LMS by clicking the “choose default school,” from the same menu. If you need to set different School Codes for each campus you can do so with the ‘Edit School Code’ function. This allows new teachers to join a specific campus during registration. Once they’ve used a School Code, teachers will be listed as Pending in the specified campus. They then need to be authorised via Teacher Permissions in order to create and manage their own classes. Can students create their own accounts in the LMS? Yes. Students can create their own accounts by registering themselves in the LMS. A student has registered with a personal email address while the Client Administrator has registered the student with their institutional email address. As the email address is a unique identifier in the LMS,the student would end up having two accounts. To prevent this from happening, the student must tell the Client Administrator which email address they have used to register. Alternatively, the Client Administrator must decide on an enrollment process whereby either the student registers themselves OR the Client Administrator creates their account. 1. Enroll the student’s account into the class and un-enroll the account the Client Administrator created. 2. Give the student the class code and un-enroll the account the Client Administrator created. The student will then have access to the product and the class. How can we receive extra activation codes? Why doesn't the student-created account show up in the directory when I search for it? This may be because the student has not joined a class and therefore is not part of the institution. The connection ("affiliation") between a student and an institution occurs when the student joins a class. A Client Administrator can search for users that he/she has created and enrolled but cannot search for user accounts created by the student unless the student has enrolled him/herself into a class in that institution. How can I add a student to a class if I cannot find them in the directory? When you bulk enroll students, you are using the student's unique identifiers – their email addresses. The LMS recognizes the email addresses when you bulk enroll the students and affiliate them with your institution. You are then able to see the students in the directory. You can also add an activated student to a class by giving the student the class code. The advantage of this method is that it requires less administration work for the Client Administrator. Why does a class appear in 'Finished Classes' if the activation code has just been activated? Check the end date of the class. If this date has reached or passed this date, the class automatically moves to ‘Finished Classes’, so changing that date to a future date means it will appear on the user’s homepage. Is it possible to reuse Class Codes? What will happen if I change an existing Class Code? Yes, it is possible to reuse a Class Code. While it is in active use it cannot be reused in another class. For you to reuse a Class Code, you must first change the code in the existing class. Students who would like to join a class after these changes have been applied must be made aware of both classes’ new codes. All students will remain in their existing classes, so would need to use an activation code for a different course, and join any new class by using a Class Code. Scores and progress will remain, and students will be still able to access the class and its contents. Is there a way to create classes in bulk within the LMS? Yes, simply head to Manage Classes > Create Multiple Classes. Select your Master Course and Class Group and then upload your completed .csv file using the sample template.Only users affiliated to a School Account are able to create classes in bulk. Why, during bulk enrollment of students, do I receive a message stating this functionality has been locked? There are times when activity on the LMS is very high and it can not immediately process requests. We recommend you try this process again in a few minutes, when it should become available. Why am I getting an error when I try to create classes or enroll users in bulk? Whenever you carry out actions in bulk by uploading a .csv file the LMS should give you a report of whether it was successful or not. If there have been any problems you can download the error report and this will give you more information on exactly what is causing the problem. • Check that you are using the correct template. If you're unsure about which template to use then try downloading the sample template from the page you're using and make sure it matches the one you've uploaded. • Make sure that you've saved the file in the correct format. Bulk upload files need to be saved as a .csv (Comma delimited) format. • Make sure that any dates are entered using the format dd/mm/yyyy. • Check that all required fields have been filled in on each row. The sample template should specify if a field is not required. Why are new users being created with numbers as their username? This happens when column headings in the enrollment spreadsheet have been changed (e.g. if the Last Name column has been changed to Surname.) Any user created in this way will NOT be able to access course content and lose any activation codes used. You will need to change the user’s registered email to a dummy email address, and attempt the import again once the headers have been corrected (please see the Sample Template for valid headers). It is very important that you notify the LMS Support Team if this happens. Please also note that an institution can use student numbers as the first name BUT they must not start with a number because this will stop the user from accessing class content and tools. Having a hyphenated surname is possible, however, it will make the username very long e.g. P60026659pedroformigo. How can I sign up a teacher in multiple classes with a single action? It’s not currently possible to assign a teacher to multiple classes with one action. However, once you have put a teacher in a class, that teacher will then be 'available' to any other class you create. Each time you create a class you can add an existing teacher to it by clicking Manage Teachers > Edit Teachers. Type in the teacher's username and click save. The teacher will appear in the class. Can the Client Administrator create user accounts and also edit them? They are able to do both. They can set up users within classes and edit a user’s profile and information. Does the Administrator have access to any "sensitive" information? The Client Administrator has access to a user’s email address, username, student date of birth, student scores, student progress, and courses used. Can the Client Administrator oversee student and teacher activity? Client Administrators can use reporting tools that allow them to see student progress. They can also access LMS statistics for all users within the Campus or School in which they are a Client Administrator, i.e. Students, Teacher, and other Administrators.Client Administrators will need to be added as a Teacher in a class in order to view the class gradebook. I'm having a problem accessing the system. Where can I get help? As a Client Administrator please report all problems to [email protected] . How do I stop a .csv file from opening with the text in a single line? In some cases a .csv file (e.g. a bulk enrollment template or a student score report) can show all the text in one line instead of in individual columns. This happens because of how Microsoft Excel behaves on some computers. Once you have downloaded or opened the CSV file and can see data appears in single lines rather than separated into cells, use the steps identified in the following URL to convert the text to columns. Please note: Any references within the data that contains a 'comma [ , ]', will be treated as a field delimiter, and result in additional columns being created. Make sure you have administration rights on the computer, or ask someone with administration rights to complete this task on your behalf. Click Start > Control Panel > Double click Regional and Language Options > Click Customize (next to your Language setting) > Ensure the Numbers tab is selected > Change the Decimal Symbol to 'full-stop [ . ]' and List Separator to 'comma [ , ]' > Click OK twice > If you are prompted to restart the computer, do so. Click Start > Settings > Control Panel > Double click Regional Settings or Regional Options > Ensure the Numbers tab is selected > Change the Decimal Symbol to 'full-stop [ . ]' and List Separator to 'comma [ , ]' > Click OK twice > If you are prompted to restart the computer, do so. Click Start > Control Panel > Region and Language > Additional settings > Change the Decimal Symbol to 'full-stop [ . ]' and List Separator to 'comma [ , ]' > Click Apply and then click OK.
Click Start > Control Panel > Region and Language > Customize/Additional settings > Change the Decimal Symbol to 'full-stop [ . ]' and List Separator to 'comma [ , ]' > Click Apply and then click OK.
Click System Preferences > Language & Region > Advanced > Then where it says 'Number separators' make sure that Grouping is set to 'comma [ , ]' and Decimal is set to 'full-stop' [ . ]' then click OK. Please note: If the file still does not display the content correctly, choose a character that is not the same as your decimal symbol instead. If your institution needs one or more additional Client Administrators please submit a request either to your local sales office or via [email protected] . We will then arrange for relevant training. How can I delete classes and / or users? Client Administrators cannot delete any classes or users from the LMS as any data cannot be retrieved once it has been deleted. • By removing the teacher/student from the class, so they do not appear in any reports or lists of "Active" and "Finished" classes. When you have removed all users from the class, you can then write to [email protected] with the name and class code of the empty class you wish to delete and they can do it for you. How can I choose which of the teachers in my school have class management privileges? Client Admins have the ability to choose which of the Teachers at their school have the ability to create their own classes. You can do this by going to the My Admin tab and then selecting Manage Users > Teacher Permissions. On the Teacher Permissions page you will see a list of the Teachers which have joined your school and can toggle whether each of them has class management permission by checking the box to the side of their name. Teachers who enter your School Code should automatically appear on this list. You can also add Teachers manually by entering their usernames on this page. Teachers who have been granted class management permissions are able to create their own classes and enroll students in them but are not able to add other Teachers to their classes. If you don’t wish to allow a Teacher to create their own classes you will need to create their classes for them and add the Teacher to the class. What are class templates and how do I use them? Class templates allow you to copy the same class settings across multiple classes. They can be useful if you need to create a large number of classes that all have the same gradebook or content lock settings. You can make any class into a template by selecting the box marked “Set as a template,” in the advanced settings section when creating a new class or from the class details menu on any class you’ve already made. This will then allow you to select that class as a template from the dropdown menu when making a new class or when creating classes on bulk. The new class will have the same gradebook and content lock/unlock configurations as the template class. It’s worth noting that any changes you make to a template will not be applied to classes you’ve already made with that template and the changes will only apply to future classes you set up. If you use templates to create a large number of classes at once you may see a message warning you that you are unable to edit class or template settings. This is because it can sometimes take a short while to copy the settings across classes. If you see this then please wait a few minutes before trying to edit your class or template again. Can I access a detailed report that includes all student scores from my school? Yes. You now have the option to generate and download detailed reports that contain either all of your student’s score and progress information or how much time they’ve spent using the LMS. To access these you just need to click the reports button at the top right of the page. You’ll then be able to select which classes you’d like to include in the report by searching for them and checking the box beside any you’d like to be included. You can narrow your search by selecting to view classes by campus, class group or product. At this point you can also select how much detail is needed in your report. You can choose between either a brief summary that includes each student’s average and graded scores or a full report covering student scores for each activity in the class. Once you’ve selected your classes click the download button to generate the report. Once the report has been generated you will then receive an email containing a link to download the .csv file which contains the report. Important note: Larger reports will take longer to generate than smaller ones. This means that if your report contains a large number of classes and is highly detailed then it may take up to 12 hours to complete. Can I disable self-study mode for students in my classes? Yes. For certain products Client Administrators and Teachers with class management permission have the ability to disable the self-study mode for students who join their classes. This can be useful if you’re concerned about students accessing content in self-study mode before it has been made available in their teacher led class. If this option is available on your course you will see a checkbox labelled “Disable self-study on joining a class” when creating your class. This box will be selected by default. You can also access the option from the “Class details” tab once you’ve created a class. Disabling self-study will hide the students self-study access but they will not lose any progress. You can enable self-study again at any time and they will then be able to enter their self-study class again, with any previous progress made intact. For more detailed videos please Login. Please provide as much information as you can to help us solve this. Do you have another CLMS account? Check in case you have activated this code already in another account. Are you using the right URL address? Check by choosing your course at www.cambridgelms.org. Please provide the usernames of the students who are having this issue in the Description field.